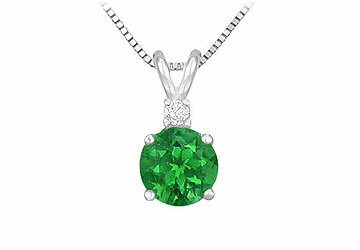 A round 8mm Created emerald is securely held in a high polished 925 sterling silver prong setting. Set atop a small round white cubic zirconia adds a touch of style. This created gemstone pendant has a total weight (TGW) of 2.00 carats comes with a standard 16 inch silver chain.